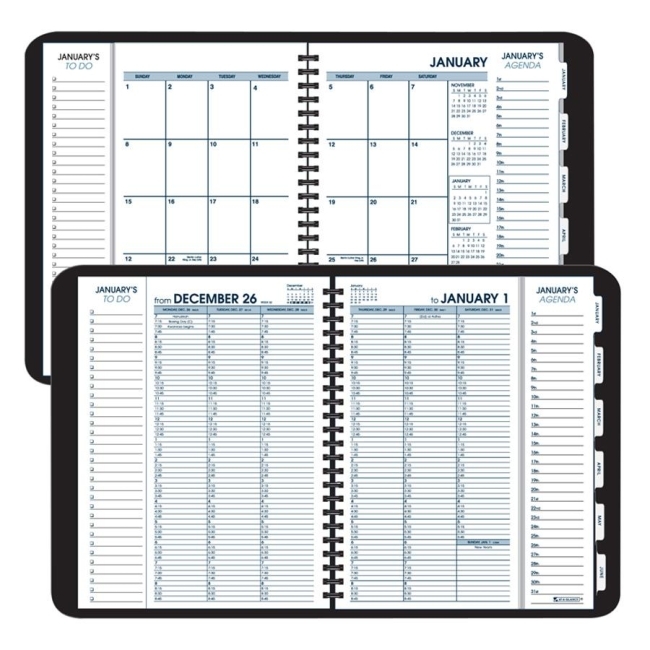 Media Size: 3.75" x 6"
Dated weekly appointment book features two-page-per-week spreads, perforated corners for easy reference, a tabbed telephone/address section, and simulated leather wirebound cover. Planning pages range 12 months from January to December. Each spread includes ruled daily blocks in a horizontal format, hourly appointment times from 8 AM to 5 PM on weekdays, Julian dates, a two-color format in black and blue ink, and current and future months reference. Calendar is printed on quality recycled paper with 30 percent post-consumer material. Nonrefillable.